AUSTRALIA’S first national grains industry logistics conference will give an insight into the challenges and opportunities facing bulk and containerised grain movement in a changing supply chain. The brainchild of Grain Trade Australia’s Transport, Storage and Ports Committee, the event is titled Evolving and Innovating the Grain Supply Chain, and is being held on 9-10 April in Melbourne. “We’re giving our members and interested parties the chance to hear from some of the major participants and innovators in the grain supply chain in the midst of some big changes,” GTA CEO Pat O’Shannassy said. They include the challenges of drought-driven redeployment of eastern Australian ports from points of bulk export to receivers of interstate grain, and the current and future use of alternative mobile ship-loading options. 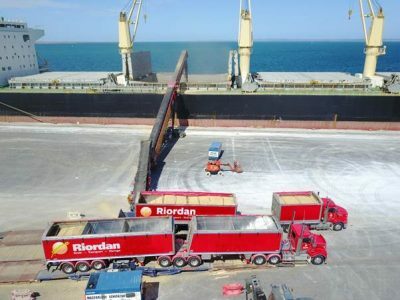 Riordan Grain Services loads a vessel at the Port of Geelong. Photo: Riordan Grain Services. These are being used by a number of exporters and new entrants in the field of portside bulk-handling, including Riordan Grain Services, and general manager Mark Lewis will be addressing the conference on the topic. Representatives from Newcastle Agri Terminal, Quattro at Port Kembla, and T-Ports, with a seaport transhipment site now under construction on the Eyre Peninsula, will also share their perspectives. Container Transport Alliance Australia (CTAA) director Neil Chambers will be looking at the landside logistics issues that contribute to added costs in the supply chain for exporters of containerised grain. Mr Chambers said the oversupply of 40-foot hi-cube containers coming into Australia with imports versus the shortage of available 20-foot food-grade containers was a continuing trend to watch. Mr Chambers said GTA was leading a discussion within the grain industry about what constituted a food-grade container. Mr Chambers said grain exporters needed to minimise their logistics costs, because rising cost pressures in Australian landside supply chains can be the difference between a profit or loss on the export of a container of grain. Mr Chambers said the world’s 10 largest shipping lines now carried 87 per cent of the world’s 20-foot equivalent (TEU) movements, compared with the mid-1990s figure of the top 20 lines carrying 48pc. Mr Chambers said a ballpark freight-rate figure to ship a 20-foot container of grain to Southeast Asia was around $400-$500, which was around half the cost of getting it from country New South Wales to Port Botany. “What we need to keep in mind is that every time you handle a container in the landside logistics chain, it adds $30-$50 to the costs. Wilson International Trade CEO Peter Wilson.